Ancient stories of Viking expeditions to Middle Easter lands may have had at least a few grains of truth, according to archaeologists analyzing a 9th century Swedish grave in which a ring bearing Islamic inscriptions was found. 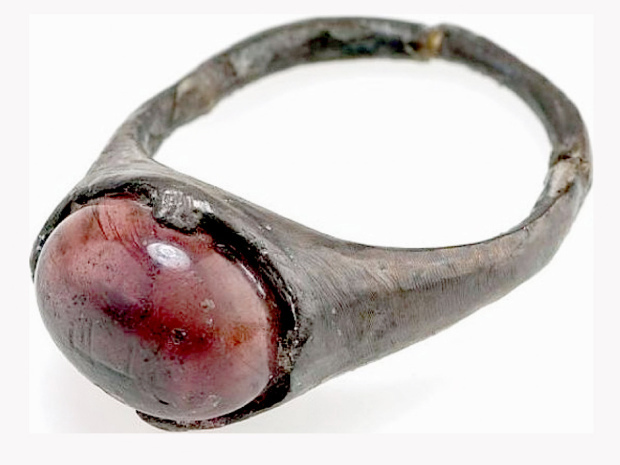 The ring bears a pink-violet colored stone with an inscription that can be transliterated as “for Allah” or “to Allah.” The silver ring had been excavated some time ago, during an elaborate archaeological dig in what was once the Viking trading post Birka between the years 1872-1895. The cite is roughly 15.5 miles west of Stockholm. It had been recovered from the base of a rectangular wooden coffin, found alongside elaborate jewelry, brooches and the tattered remains of clothes. The body had deteriorated entirely, but the possessions left behind suggested that it was a woman who had been buried, somewhere near the year 850 A.D.
Just recently, the object became the focus of interest for an international team of researchers, led by the biophysicist Sebastian Wärmländer from Stockholm University. “It’s the only ring with an Arabic inscription found in Scandinavia. We have a few other Arabic-style rings, but without inscriptions,” Wärmländer said to Discovery News. The Vikings covered considerable territory in what has long been (sometimes perhaps unfairly) referred to as Europe’s Dark Ages. In addition to conquering Great Britain and establishing cities such as Kiev in Ukraine and Dublin in Ireland, they also led many expeditions to the New World and traded with the natives, although they seldom dared to go much further than the beaches for fear of confrontations. By the ninth century, Islam had a considerable empire in the Middle East that would probably also be attractive for the Vikings. Reviewing the piece with a scanning electron microscope, Warmlander’s team realized that the description left by the museum wasn’t fully accurate. “Our analysis shows that the studied ring consists of a high quality (94.5 percent) non-gilded silver alloy, set with a stone of colored soda-lime glass with an Arabic inscription reading some version of the word Allah,” concluded Wärmländer and colleagues in the journal Scanning. Although they established that the stone was not made of amethyst, as long presumed, it wasn’t necessarily a composite of lower value. “Colored glass was an exotic material in Viking Age Scandinavia,” Wärmländer said. It would not be until the higher Middle Ages that it became abundant, with the advent of cathedrals. At the time, amethyst was also highly prized in medieval Europe, attributed to have many properties – including warding off hangovers and drunkenness. When large mines of it were found in Brazil in the 17th century, its value shriveled considerably. A cloer look revealed that the ring of colored glass wad been engraved with a message in early Kufic characters, ones that were consistent with the ninth century grave at Birka. The inscription reads literally as “il-la-lah,” which means “For/To Allah.” However, there are alternative interpretations to what the engraving might indicate. The letters could be transliterated as “INs…LLH” which would mean “Inshallah” (God-willing). “Most likely, we will never know the exact meaning behind the inscription, or where and why it was done,” the researchers wrote. “For the present investigation, it is enough to note that its Arabic-Islamic nature clearly links the ring and the stone to the cultural sphere of the Caliphate,” they added. Perhaps the most intriguing discovery is that despite the circumstances and age in which the ring was exhumed, its body remains in mint condition. “On this ring the filing marks are still present on the metal surface. This shows the jewel has never been much used, and indicates that it did not have many owners,” Wärmländer said. This would hearken back to the ring’s own history. While many may have thought it was simply some stolen piece that was pawned and traded, buried with someone who was never anywhere near the Middle East, it seems that its destination of Birka was hardly accidental. There is little evidence that the ring was passed along to many people. “Instead, it must have passed from the Islamic silversmith who made it to the woman buried at Birka with few, if any, owners in between,” Wärmländer said. “Perhaps the woman herself was from the Islamic world, or perhaps a Swedish Viking got the ring, by trade or robbery, while visiting the Islamic Caliphate,” Warmlander continued. Whatever the case, the researchers have concluded that this ring is concrete evidence of interaction between the Vikings and the Islamic empire. “The Viking Sagas and Chronicles tell us of Viking expeditions to the Black and Caspian Seas, and beyond, but we don’t know what is fact and what is fiction in these stories,” Wärmländer said. “The mint condition of the ring corroborates ancient tales about direct contacts between Viking Age Scandinavia and the Islamic world,” he said. It could certainly be a sign that these cultures saw more of each other than we once believed.